Nursery or children's collage unisex frame overall size 18.5 x 10.25 fits 8 wallet photos and one 5x7 photo. 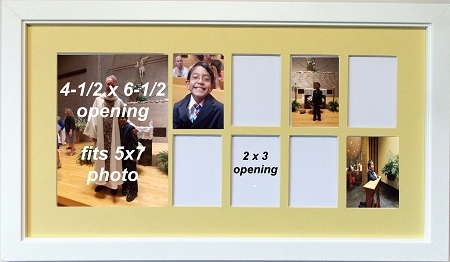 White wood frame has easy access to frame and includes a light yellow custom mat with beveled edges. Frame unit includes glass, mounting board and hanging system.